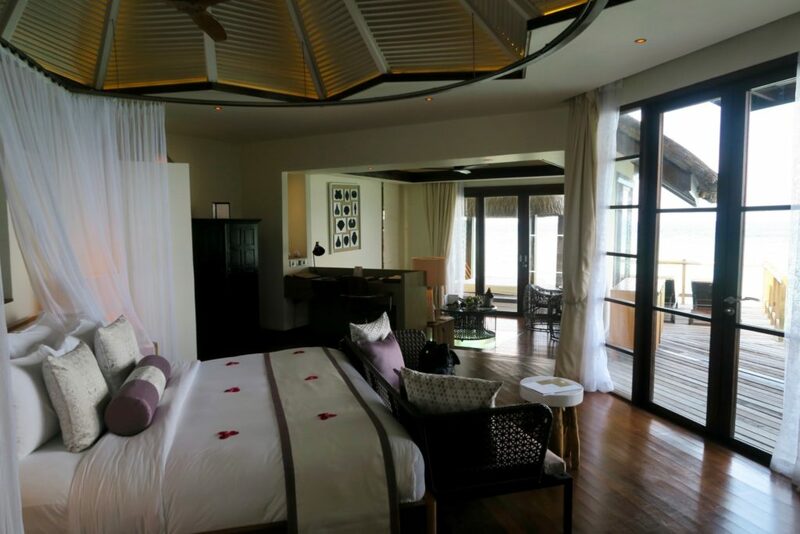 Jumeirah Vittaveli Maldives Resort Review - Holy Smithereens! There are hundreds of resorts in the Maldives, all with different styles and resort personalities. I’ve always stressed that the Maldives resort you choose will make or break your experience, and this couldn’t have been more true during our stay at Jumeirah Vittaveli Maldives. 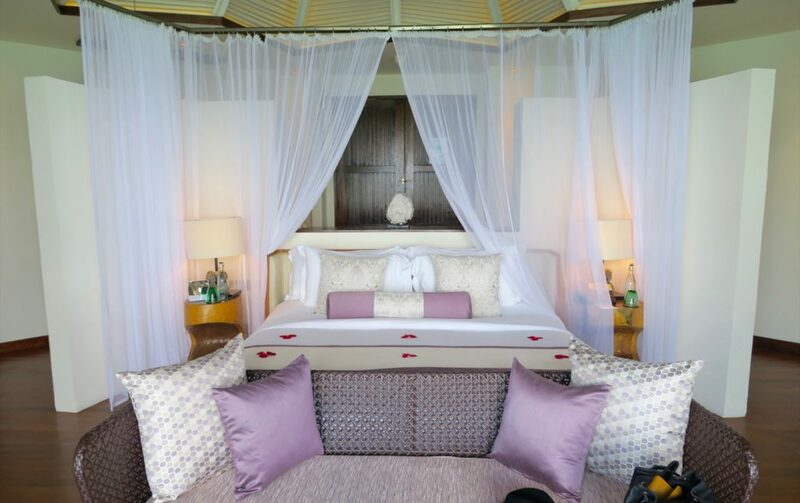 Jumeriah Vittaveli is known for its ‘subtle luxury’ style, and this is the main reason why we chose it. Looking at our travel calendar, I saw that we will be in the Maldives for Zombie’s (my husband) birthday. So I wanted this Maldives trip to be all about Zombie’s interests and style. He has done quite a lot for Holy Smithereens (and continues to do so!) yet is happy to be the silent and strong anchor. So I made sure that the resort we will be heading to on his birthday is up his style. If you know him in real life, and if it still isn’t obvious from his lack-of photographic presence in Holy Smithereens, my husband’s style is indeed subtle. 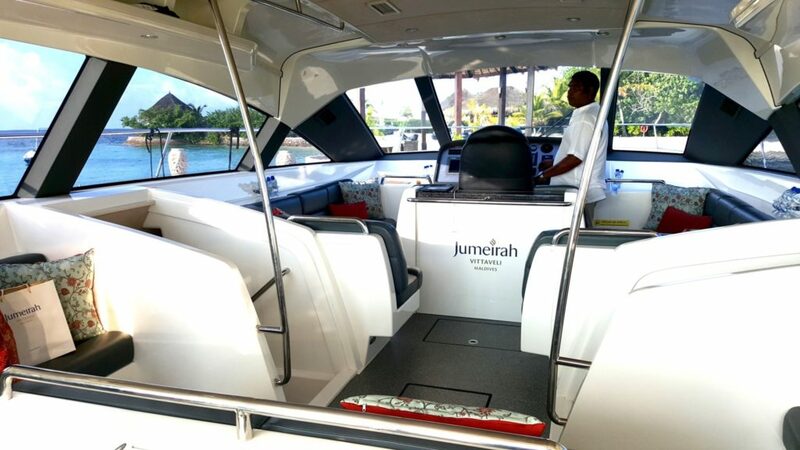 Located in South Male Atoll, Maldives, Jumeirah Vittaveli is a short 20-minute speedboat ride from Male Ibrahim Nasir International Airport. Guests who arrive either by plane or by speedboat (if coming from another resort) will be met by a Jumeirah representative and are led to the lounge. 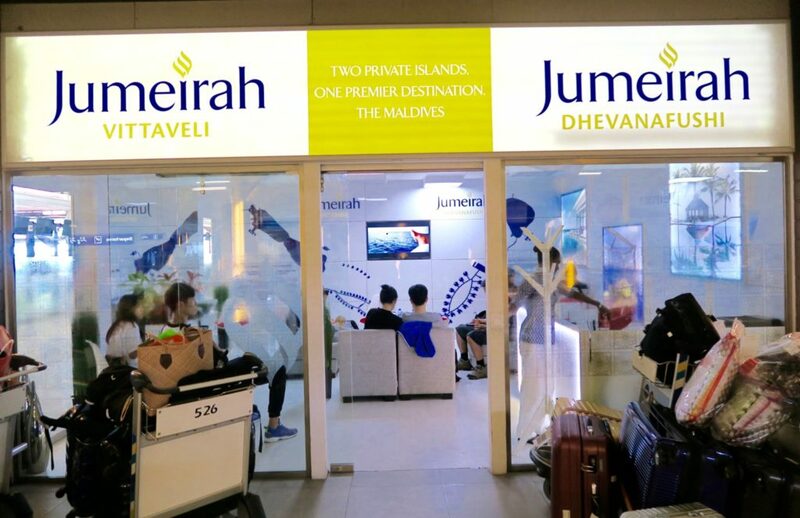 Jumeirah, a global luxury hotel brand and a member of Dubai Holding, has two resorts in the Maldives. 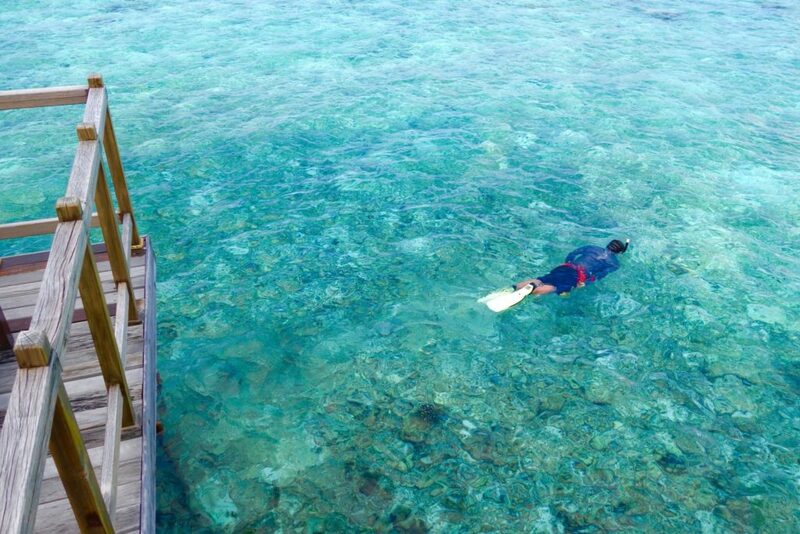 Jumeirah Dhevanafushi, which requires a seaplane to reach, and Jumeirah Vittaveli, by speedboat. We waited no more than 10 minutes when we were asked to board the speedboat. 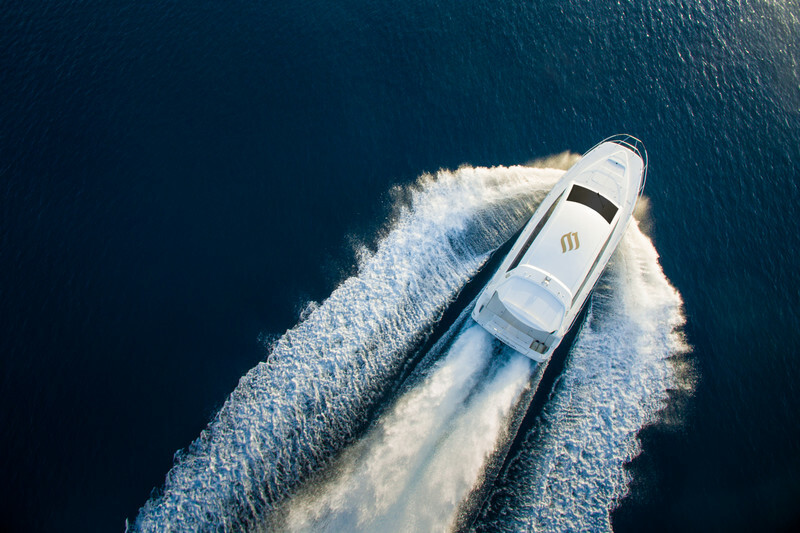 Jumeirah has a new fleet of luxurious motorised catamaran. It was so comfortable and so brand new new that the lovely leather smell is still there, and I found myself wishing that the 20-minute ride was longer. 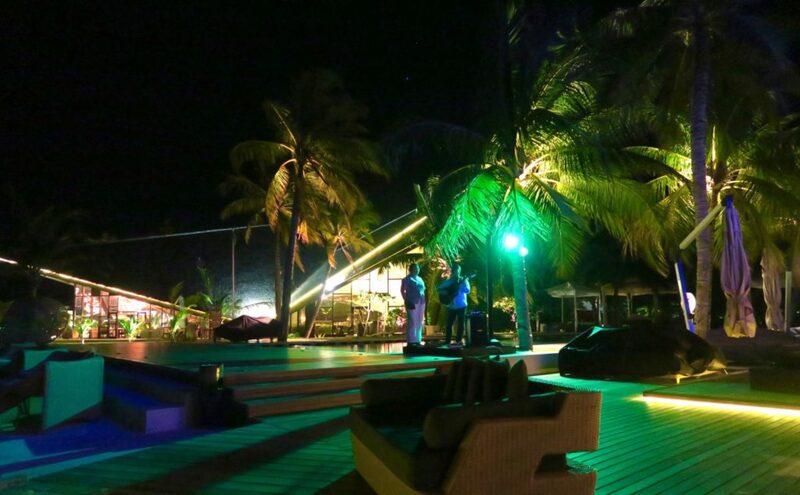 Welcome party at Jumeirah Vittaveli! Arrival at the jetty was such a festive affair. A lot of drum beats, clapping and warm greetings. We were then introduced to our villa butler, a nice lady named Faith (love the name!) and she escorted us to a buggy to get to our villa. 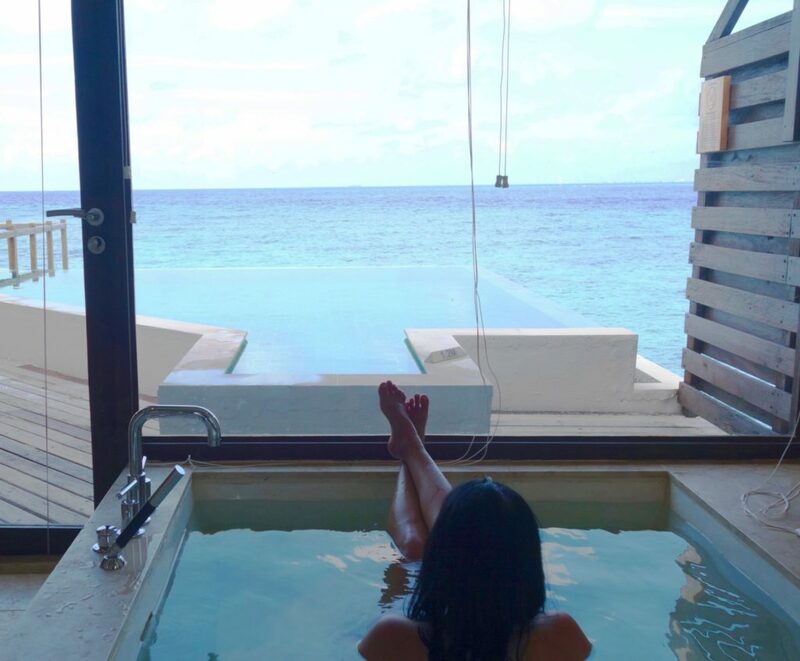 All rooms at the Jumeirah Vittaveli come with generous-sized pools. But I find that it wasn’t only the pools that were big in space. 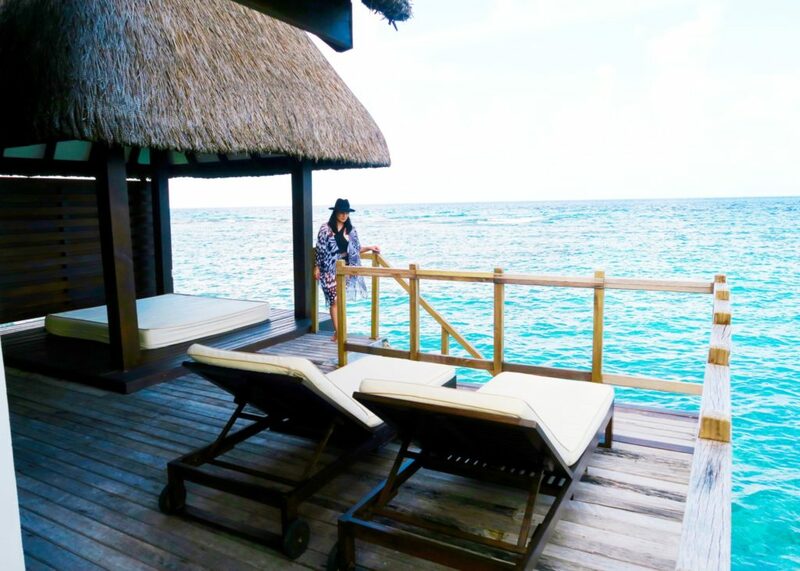 Every overwater bungalow is different, and our Water Villa at the Jumeirah Vittaveli is the largest we’ve ever checked in to. It has an expansive space of 200 square metres, and has a full-sized living room and working area which is separated by a couple of steps from the bedroom area. I also like the unique design of the double doors of the villa opening to face the head of the bed, with tall ‘walls’ to separate the bedroom area. This is great for privacy, because should your door be opened for quite some time, passers-by would not be able to get a glimpse of anything personal, just that wall separation. 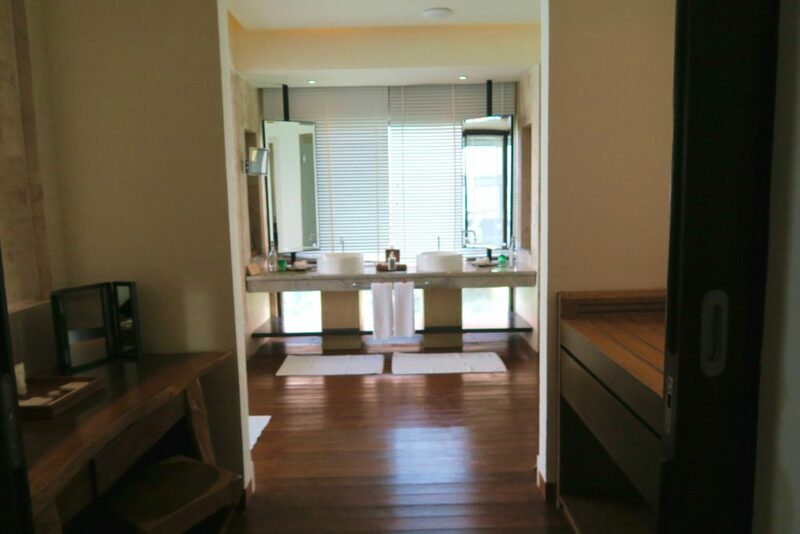 There’s a hundred and one reasons to linger in the villa bathroom , but number one is the deep tub that overlooks the pool, that overlooks the Indian Ocean. How much ‘overlooking’ one stunning thing after another can one handle? 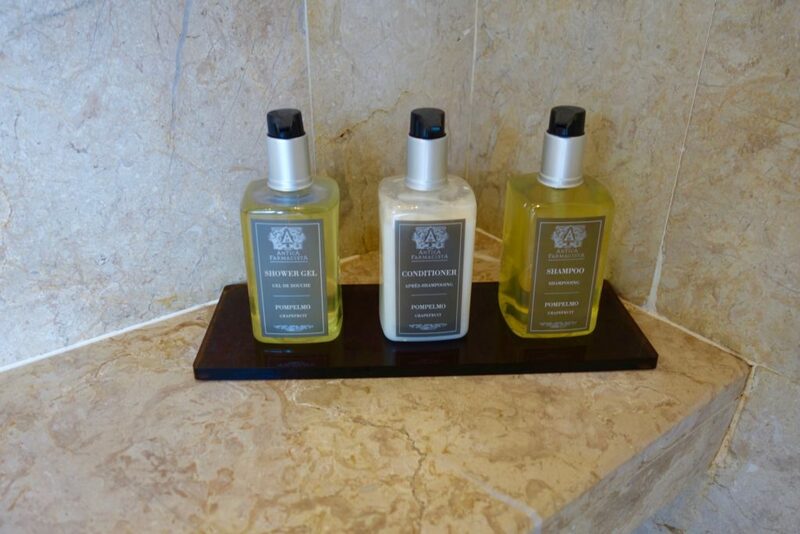 Shower toiletries are from Antica Farmacista line (known for its luxury home fragrance line). I love the grapefruit scent! And in the dressing area, there’s an array of very thoughtful toiletry items by the Jumeirah line. You can find an insect repellant, sunscreen, aftersun gel, and even a lip butter! The generous space continues all the way to the bathroom, where there’s a walkway that also serves as a dressing area and a vanity desk. Two sunloungers, a daybed, a pool, and a deck table with chairs – there’s so many choices of areas to chill in the spacious overwater deck. If you still cannot find your space, there’s always the turquoiuse waters below, just mere steps away. Needless to say, sleeping in the villa was the ultimate way to get the ideal 7-9 hour beauty rest as it was extremely comfortable. A luxurious sleep means we are charged and ready for days that hold a lot of adventures! 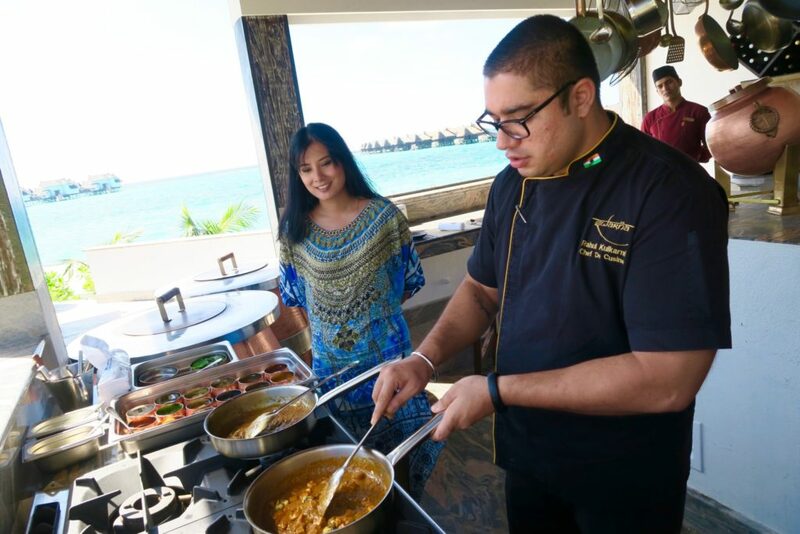 As tempting as it was to cocoon myself inside our water villa, there are a lot of activities available in Jumeirah Vittaveli that you can’t miss. 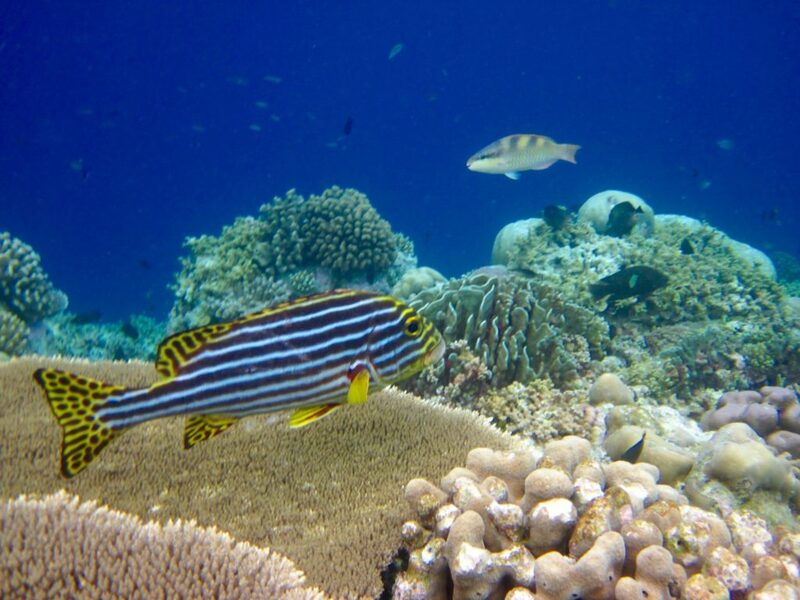 Even with Jumeirah Vittaveli’s close proximity to the Maldives, there are a number of vibrant reefs nearby and we hopped on a dhoni (traditional Maldivian style boat) to explore them. I was impressed with this snorkelling tour because our group had a snorkelling guide who actually went in the water with us. This was necessary because there were 4 other couples with us, and more importantly, the current was quite strong that morning. Safety was the focus because our guide had a life ring ready (with string) and from time to time, passed this on to people from our group who became exhausted from swimming against the current. Well at one point when we were in the water, we saw a pod of dolphins about 10-15 metres from us! Zombie and I desperately tried to swim as fast as we can towards them. But 10 metres in the sea is much different than dashing 10 metres on land! And with the extra current, we lost them, and could only faintly hear their noise underwater. 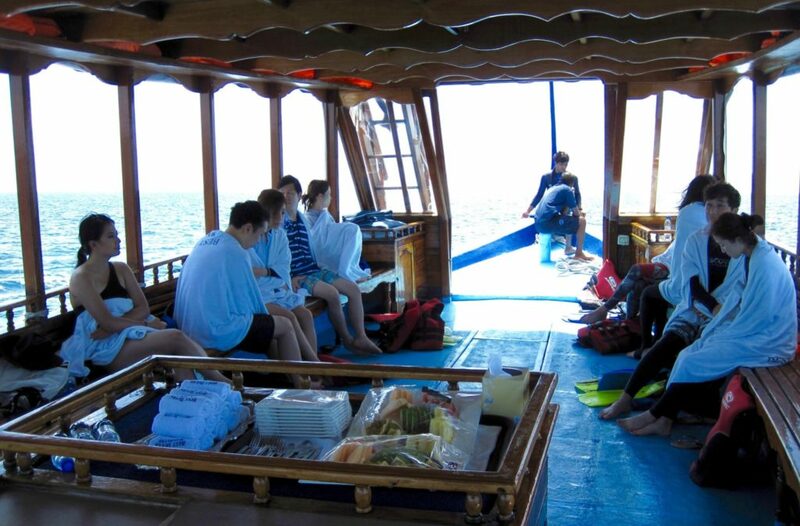 Missed dolphins and currents aside, the coral reef was large and we did see a fair amount of underwater life. 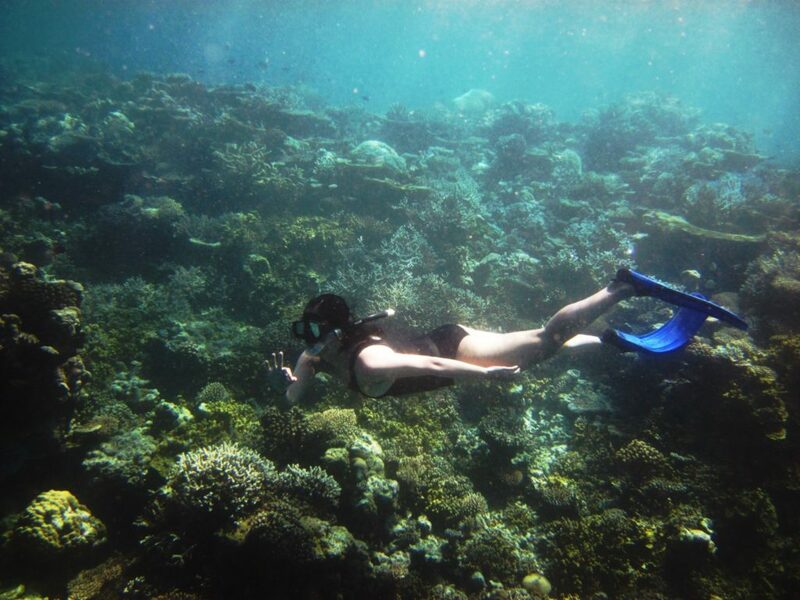 We snorkelled in two reefs that day as our guide decided to change reefs when the currents got too strong. A morning spent in the ocean needs to be met by something soothing and relaxing. We had a couples massage treatment when we got back to the resort. 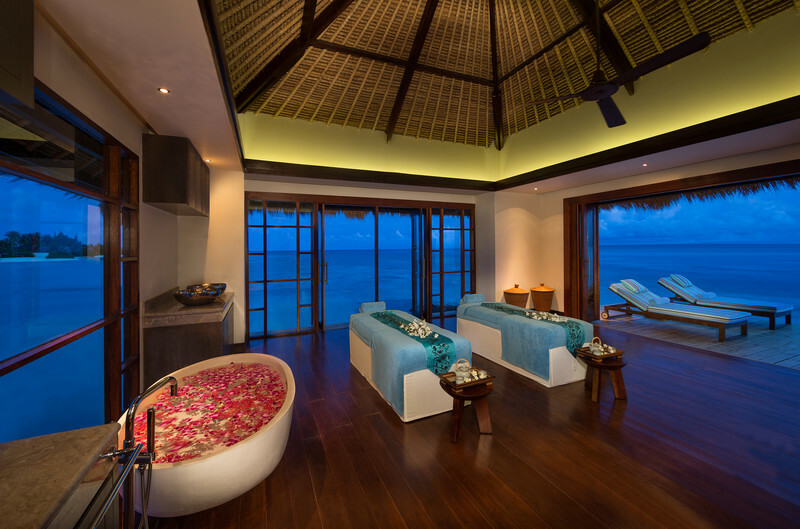 At that time, the overwater Talise Spa was undergoing renovations so Jumeirah Vittaveli dedicated a couple of their beach villas as a temporary spa area. 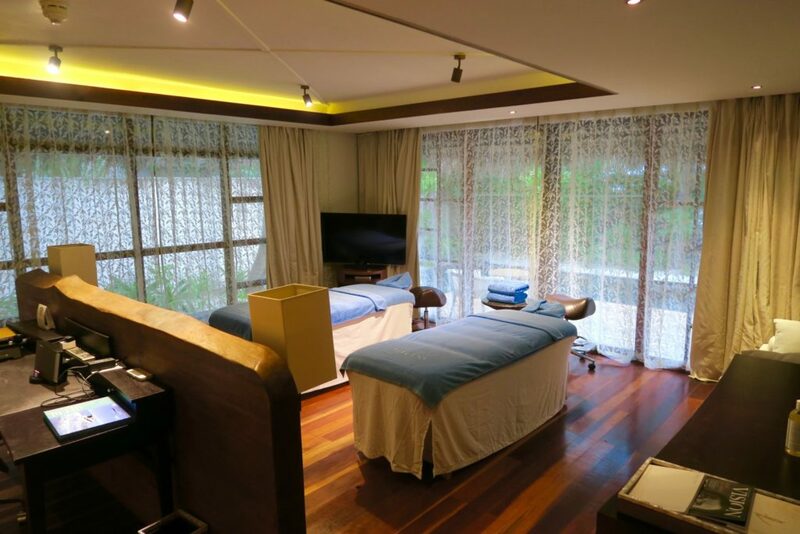 The 1-hour signature Talise Spa massage was so heavenly that we found ourselves purchasing add-ons (a facial and eye treatment) to our already blissful treatment. We left the spa rejuvenated and felt that the Talise Spa magic touch was so felt, even if we didn’t have it in the original location of the spa. 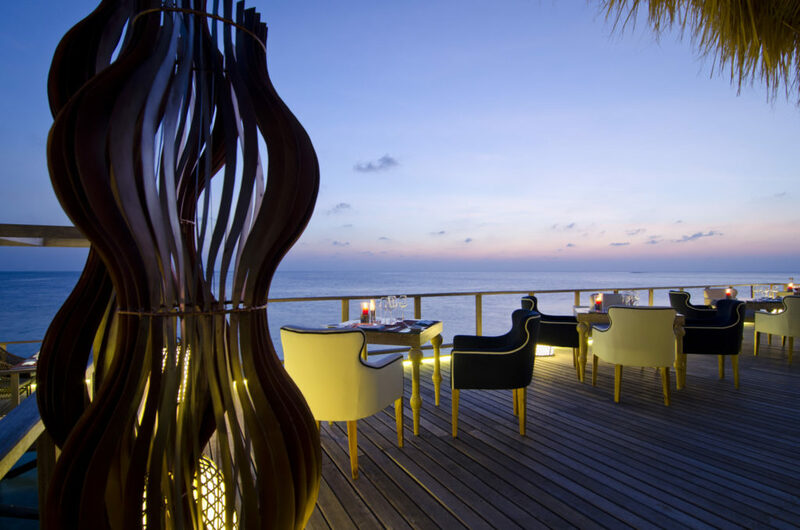 Fenesse is Jumeirah Vittaveli’s formal dining option. 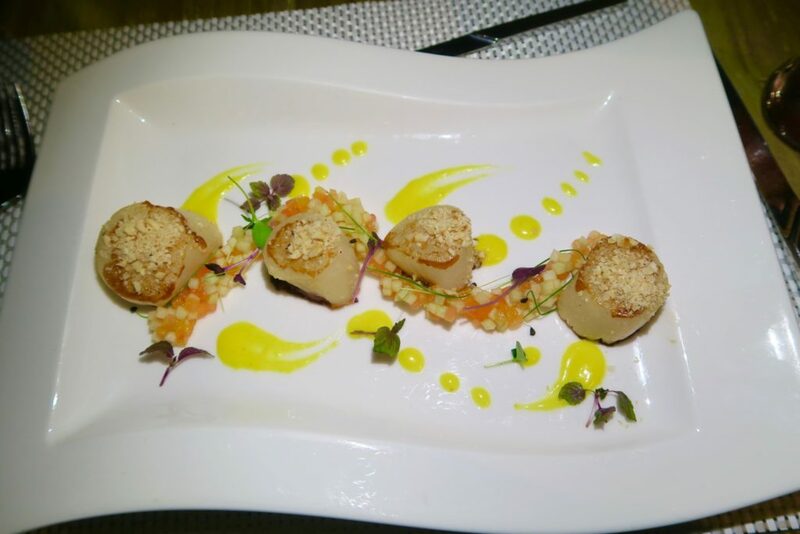 It serves French cuisine in an al-fresco setting. Zombie’s birthday cake!! Thank you, Jumeirah Vittaveli!! Then they all sang and wished my Zombie a happy, happy birthday 🙂 Such a nice and thoughtful gesture! And I’m so glad it was done quite discreetly without so much fanfare. Again, subtle but a lasting impression. Just the way my husband is! Although blushing, Zombie looked pretty thrilled as he cut the cake. It was a nice chocolate torte cake that was just the right size for us two. 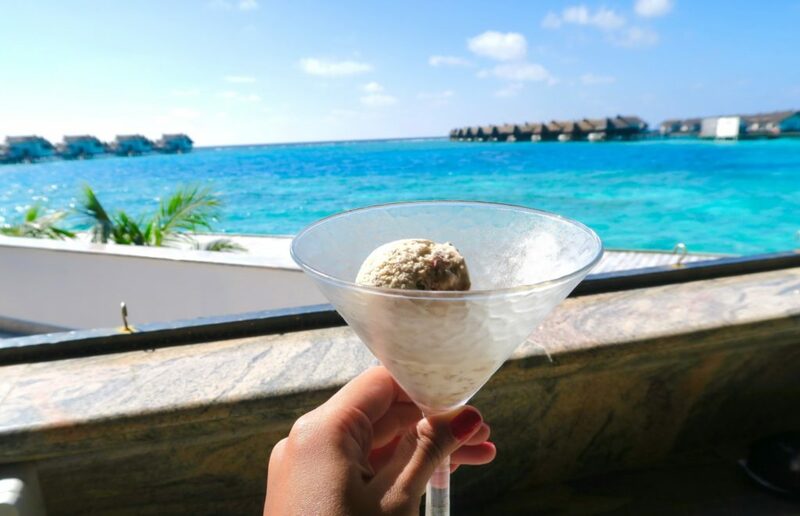 After we had our cake and thanked the staff, they suggested we take a walk to Bar-EE, Jumeirah Vittaveli’s bar that has a panoramic sunset view. Although sunset was long past gone, we headed there as we could see lights and hear some music coming from the area. It wasn’t that late (maybe close to 10PM) but we noticed that the place was almost empty. But the band duo was really giving a great performance. And upon closer look, we noticed that the singer was none other than our butler, Faith! Talk about being mutli-talented! We sat down and when she saw us, she and the guitarist came over and sang Happy Birthday to Zombie. Two birthday songs in one night! This was really such a memorable night for both Zombie and I, and a great way to cap off his 37th year. As we walked back to our villa, we were musing over how wonderful tonight really was. 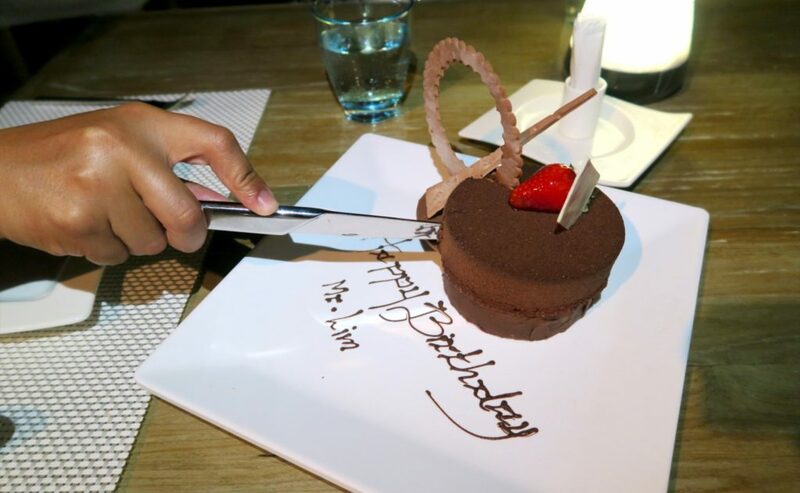 Such thoughtfulness (especially from our butler Faith!) and low-key ways to make one feel special on his birthday. And then we find our bed with this greeting! Zombie didn’t just have one, but THREE greetings in this special evening. And then Zombie did the unthinkable. He laid on the bed mermaid style for a photo-op. If you really knew Zombie in real life, you’d know that this would be the last thing he’d ever do. The next day, we had a grand time sleeping in. No more worrying about making it to the breakfast timing because we were going to have breakfast in our villa. This was no ordinary breakfast room service. 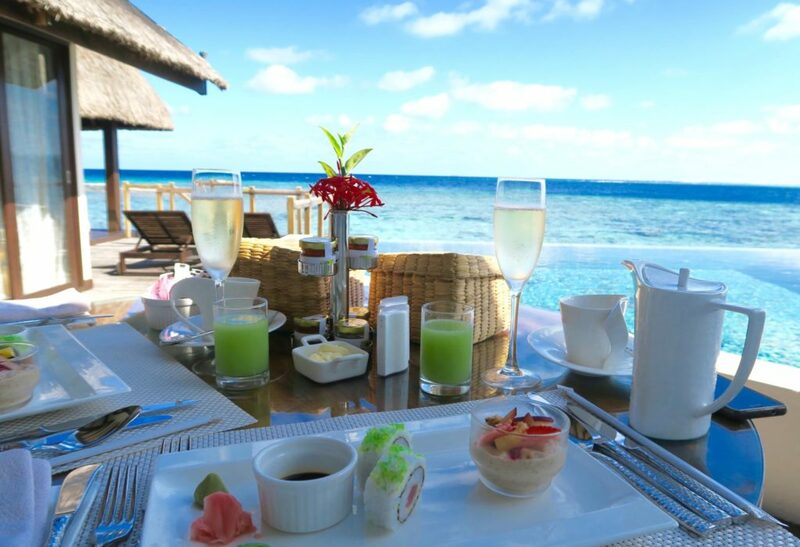 A staff came with our breakfast (and champagne) and proceeded to set it all out in the table at the overwater deck. 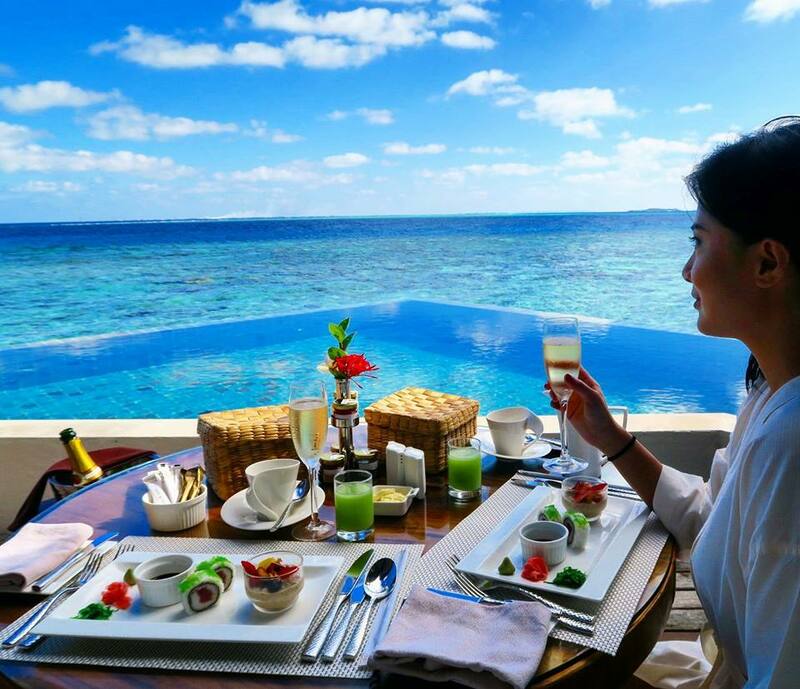 In-Villa Champagne breakfast at Jumeirah Vittaveli. Easy like Sunday morning! In terms of indulgence (and guiltless laziness if you love sleeping-in like me! ), this experience is pretty high up in the luxe list. And it was a complete breakfast set-up too. We had toast, fruits, cereal, muesli, and sushi! We also had green juice and of course, champagne. 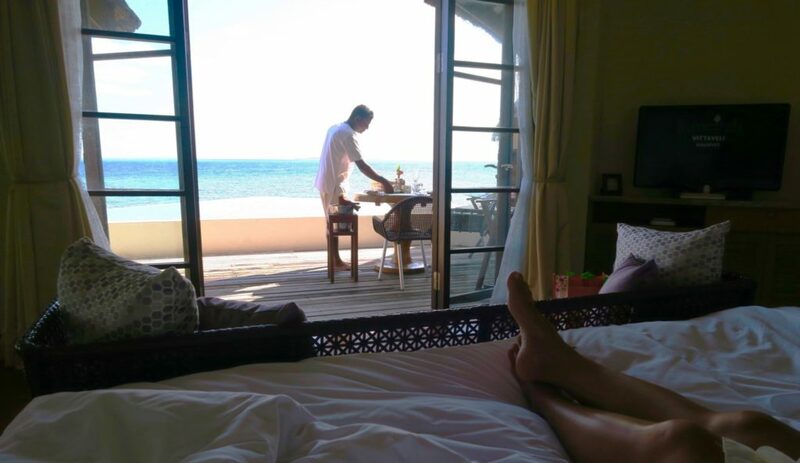 If you are staying in an overwater bungalow, I highly recommend getting this experience. Wasn’t I just rambling on how I wanted to spend more time inside the villa? 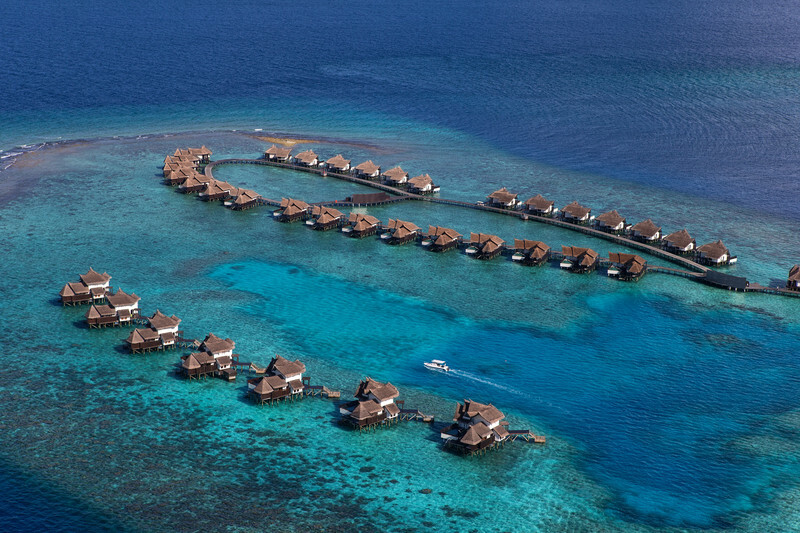 Well this is definitely a must-do in your overwater bungalow. Starting my day in the Maldives in the most indulgent way! The real luxury lies in having to just roll out of bed, wearing your pajamas, robe, or swimwear – whatever you want, really! And taking all the time in the world having breakfast in front of such an amazing view. I’ve had many unique experiences in the Maldives, but this certainly tops my favourite. It’s the perfect combination of indulgence and privacy, done in that Jumeirah way of pampering guests. 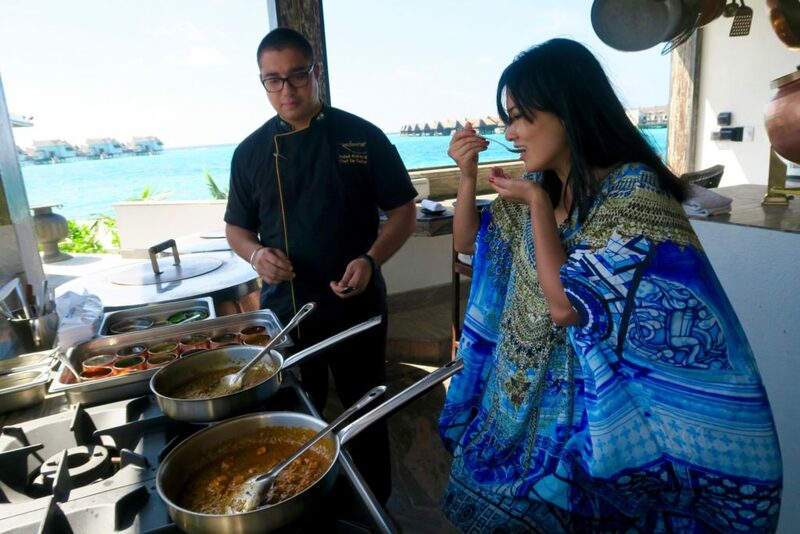 Jumeirah Vittaveli has a number of restaurants within the resort, but one of the newly opened ones is Swarna (which means ‘gold’ in Sanskrit), their fine-dining Indian restaurant. 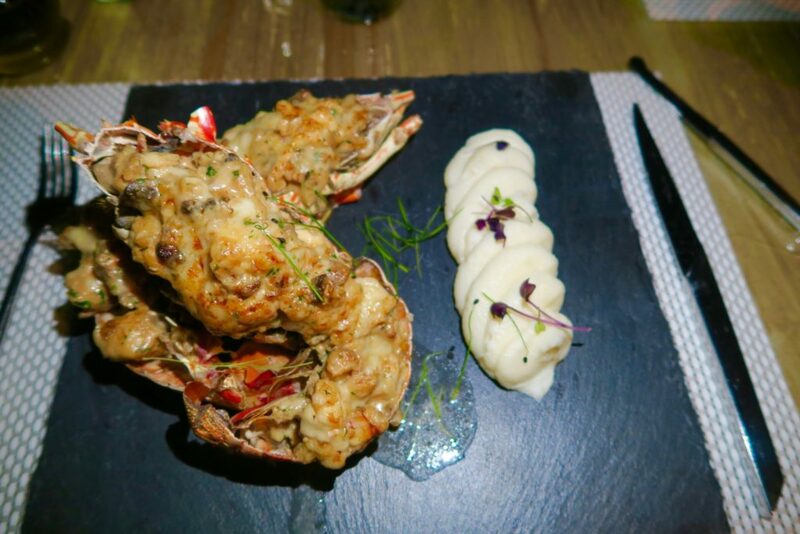 Jumeirah’s tag line is “Stay different”, so we were not going to just have normal lunch served to us. We were going to learn how to make it! Chef de Cuisine of Swarna, Rahul Kulkarni, welcomed us to the kitchen, which has such a marvellous view, by the way! 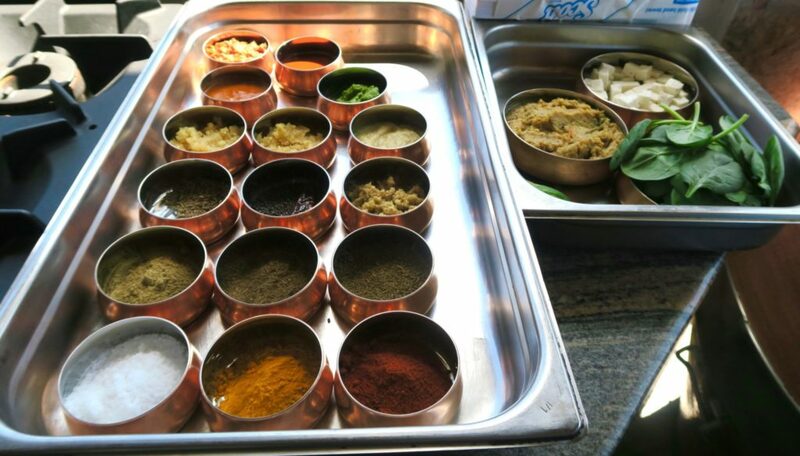 And taught us how to make three vegetarian Indian dishes. The secret lies in using fresh herbs and spices. No packaged anything in this kitchen! 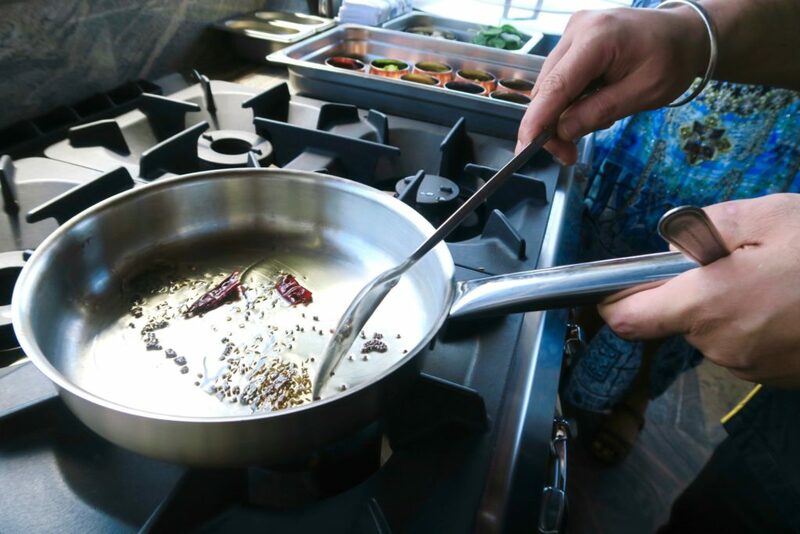 I was already in spice heaven just being in the kitchen, but more so when Chef Rahul started the heat. Zombie and I both love curries (he is Malaysian-born), but we both cannot handle heat / spicy food. And I’m so relieved that Chef Rahul explained that it’s a misconception that Indian food is spicy. 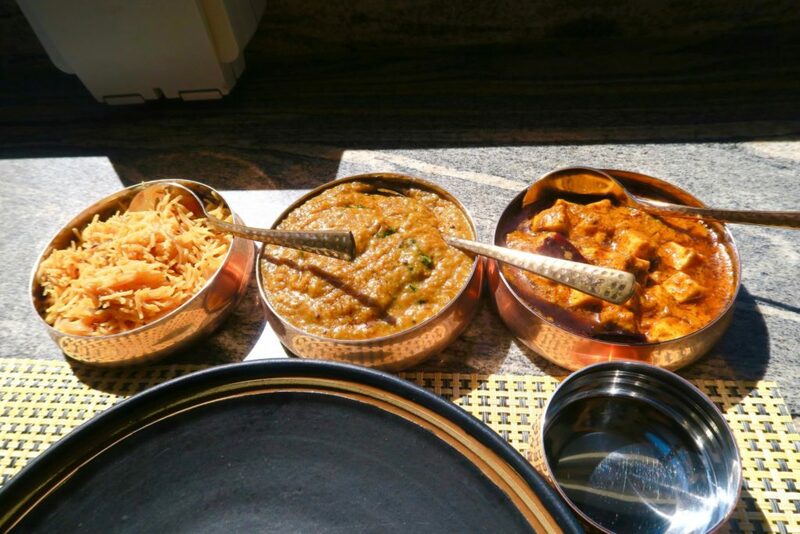 Indian food is flavourful – every bite has a burst of medley of flavours! And here we go, in less than 30 minutes, Chef Rahul (with our bit of assistance), whipped up the most amazing curry lunch Zombie and I ever had. We had basmati rice (the basmati rice they had was so long, it looked like chopped noodles!) , Dal Palak (Spinach Dal), and Paneer Lababdar (milk curd cheese and tomato curry). I cannot wait to recreate these dishes when winter comes! Can you imagine just how comforting they’d be? Rose and Saffron Ice Cream for dessert! And for dessert, we had ice cream, in the most unusual flavour I’ve so far had. Rose Saffron, which had real rose petal bits. I’ve to say the flavour must be acquired but it was really refreshing, especially in the Maldivian afternoon heat. Just before sunset, we headed out to the sea in a dhoni. 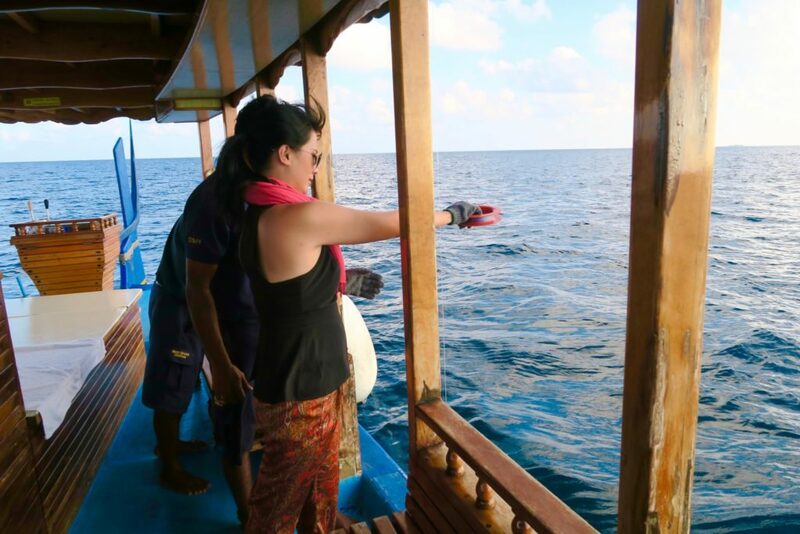 This time, we were going to learn the traditional way of Maldivian fishing. Line fishing, which does not use any reel or rods at all. Just a string, hook and gloves. Zombie loves to fish so he was really having a ball. Now I love fish. I love seafood. But I can’t say that fishing is my favourite thing to do. 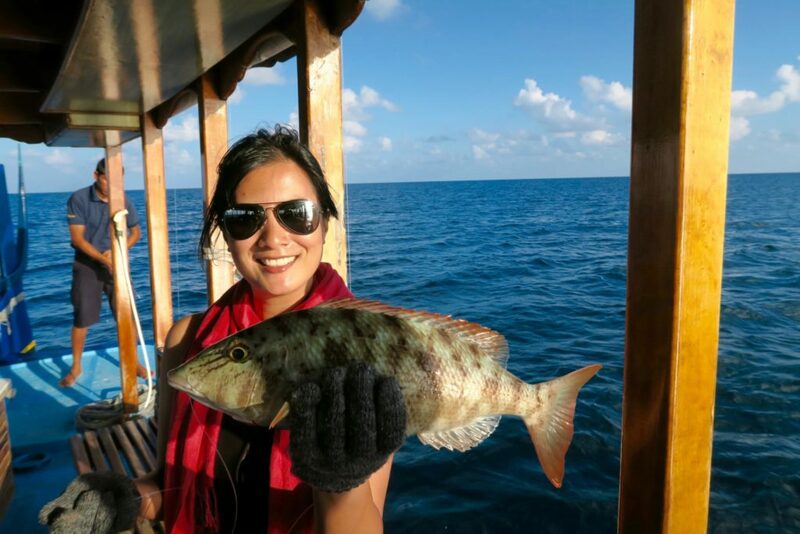 However, I seem to always have good luck when fishing – in less than 10 minutes, I had a bite, and was the first in the boat to pull up a fish! There’s no fish-switching here, folks. This was my actual fish! I can’t believe it. Whenever we go fishing, I always just reluctantly plop or whirl out the rod and I most always get the first fish. But I’m so glad to have caught this. It’s a full-grown adult and in perfect size. 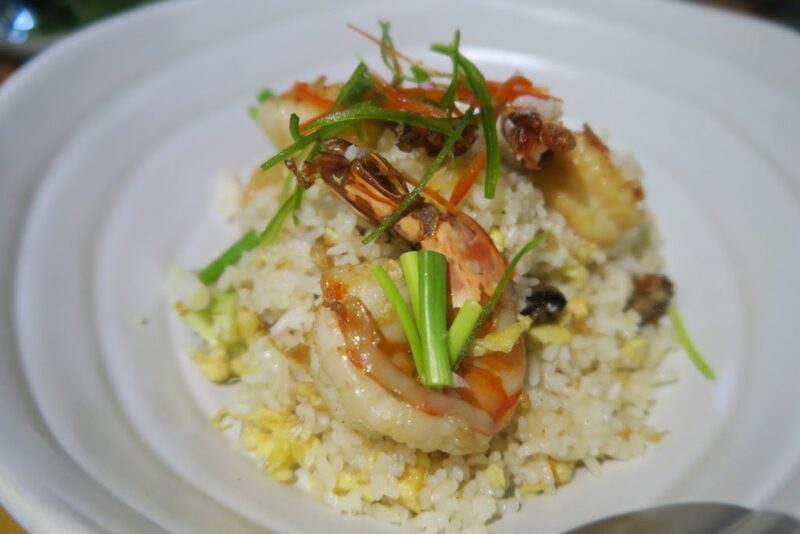 The prawn fried rice was amazing too! 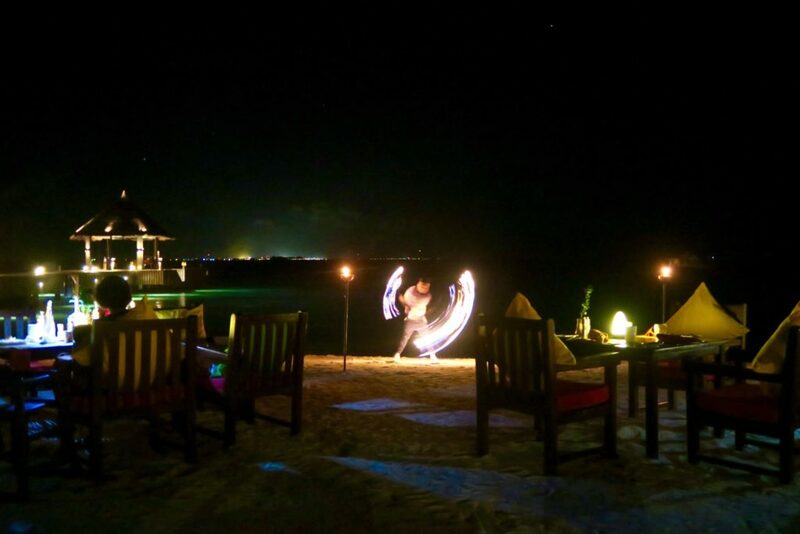 For a total beachside dining experience, I highly recommend MU Bar, as they also have fire dancers perform live at night. 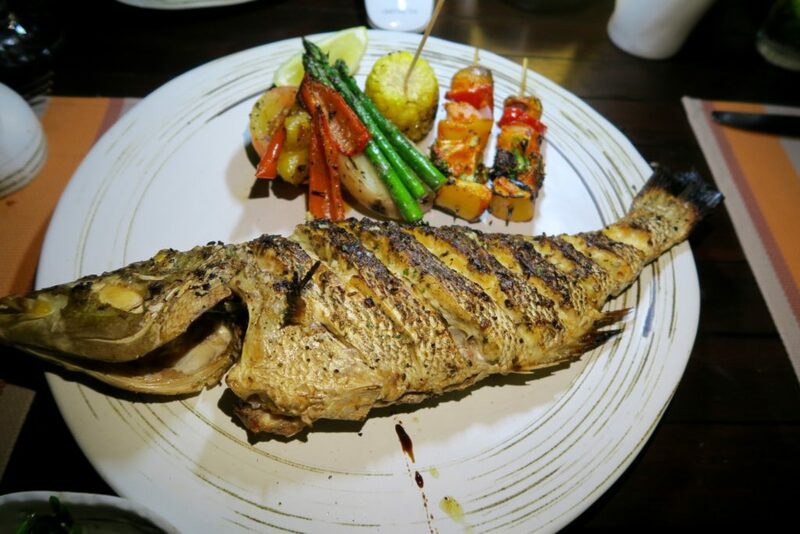 From our luxurious champagne breakfast, to our educational and interactive curry lunch, and the most memorable sunset fishing that ended up in our dinner plate, we went to bed that night overwhelemd with happiness. 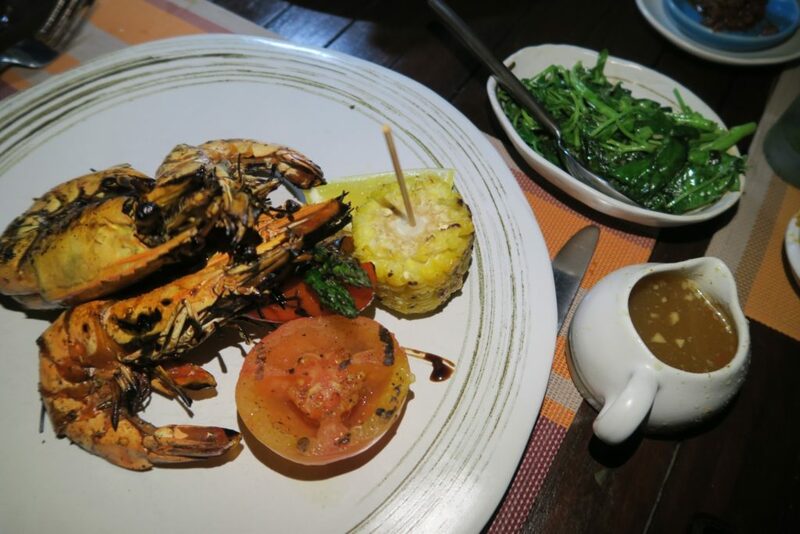 Our tummies were full from glorious fresh food and our hearts and minds filled to the brim with memories of joy through the day – we relished just how memorable this trip was. I’m so happy that we picked Jumeirah Vittaveli for Zombie’s birthday. Everything in this resort fits Zombie’s personality. 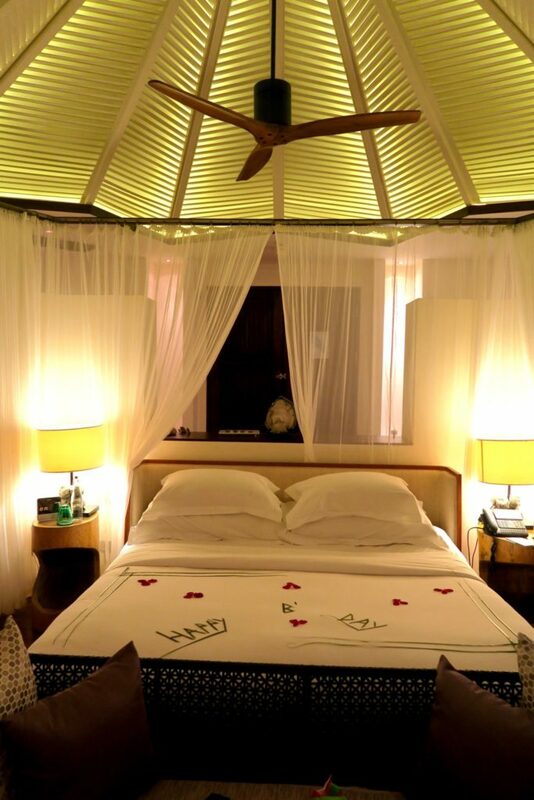 Jumeirah Vittaveli is a family and couples resort. It has complete day care amenities (and more), yet one thing I noticed in the resort is how serene and quiet it was. 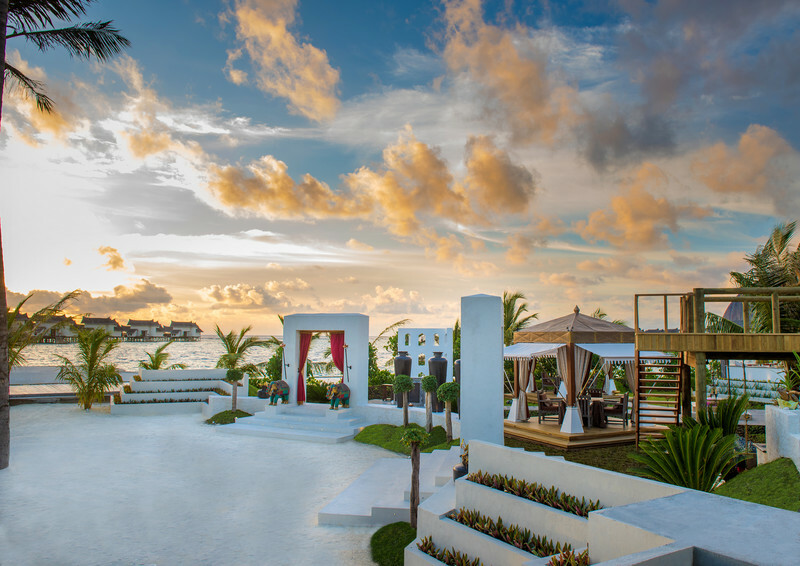 Not only did we indulge in luxurious experiences like the couples massage, and our champagne breakfast, but it was also balanced by being active through snorkelling, and also taking home skills that we can use for life – fishing and cooking. 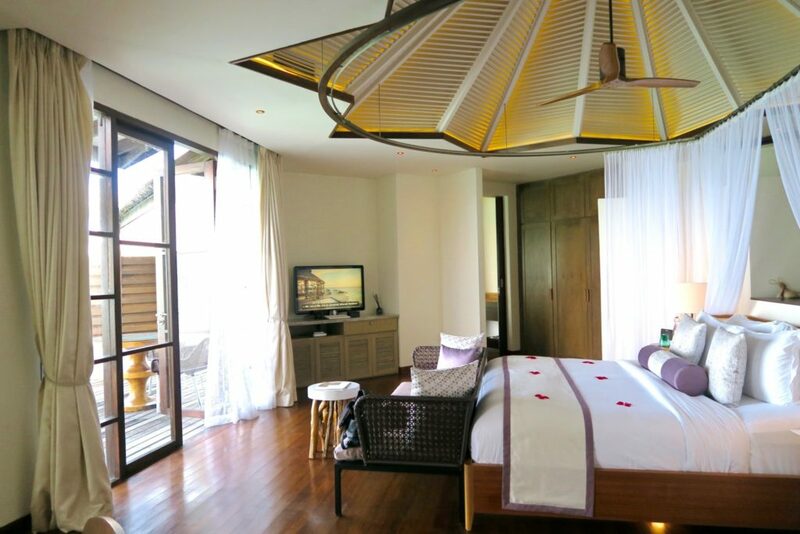 The resort is luxurious yet does not show this in an outlandish way. It’s subtle, and focuses on the simple things that all make up memories that will never be forgetten. 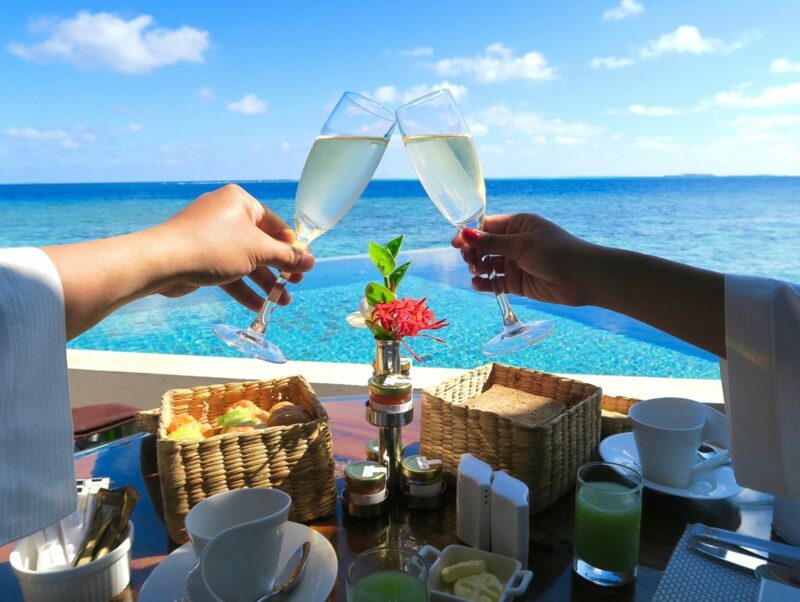 Cheers to the good times at Jumeirah Vittaveli! What is your resort-style personality? Are you also subtle like Zombie? Or do you prefer a more out-there experience? 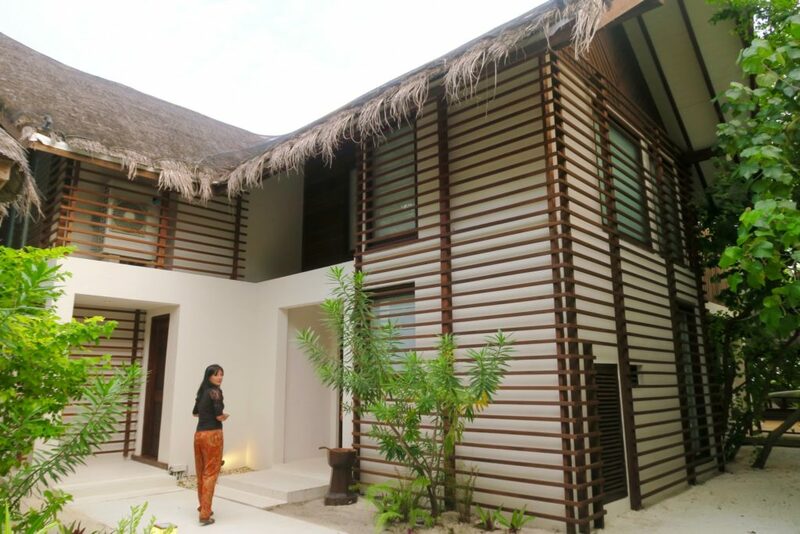 We stayed as guests at Jumeirah Vittaveli Maldives, but all thoughts and opinions are my own. 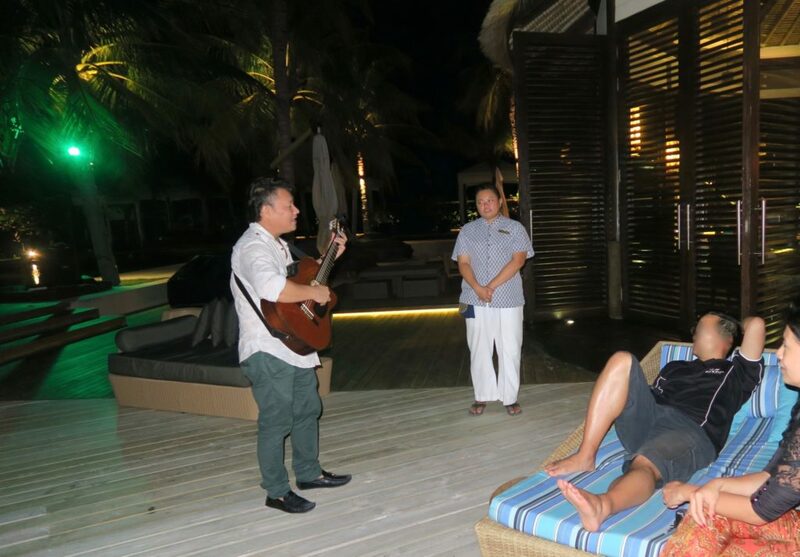 A huge thanks to the staff of Jumeirah Vittaveli for creating the most unforgettable birthday memories for my husband! Thank you Lorraine! 🙂 I’m glad that Zombie was able to meet you even for just a brief moment. And yes that overwater villa is really one of the most unique I’ve seen in the Maldives! Happy Birthday Zombie! What a magical place – that’s certainly one birthday I’m sure he’ll never forget! It looked absolutely dreamy! And check out that fish! You totally outdid yourself! 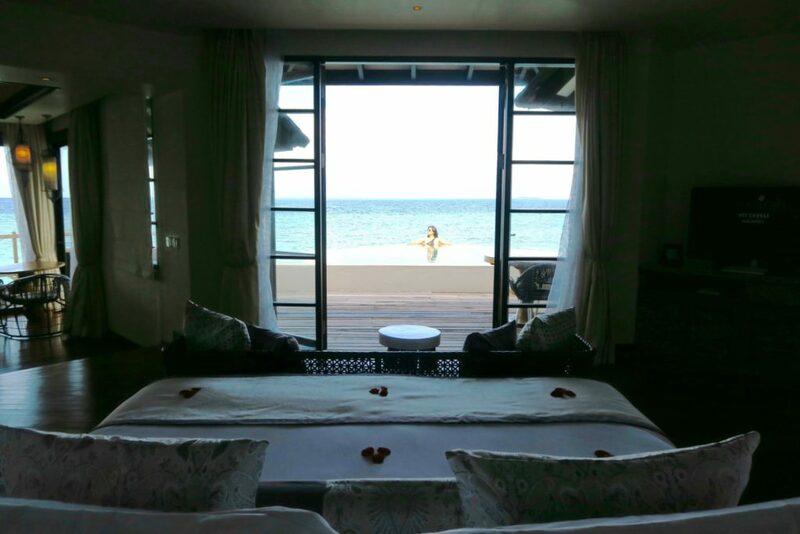 The deep tub that overlooks the pool, that overlooks the Indian Ocean…. I want in! Wow, what a fab way to do bath time. 🙂 Happy Birthday to Zombie, I am sure it was a bloody brilliant way to celebrate and wont be forgotten anytime soon. Thanks Anna! Yes, the overlooking the overlooking feature! haha! It’s absolutely the place to indulge 🙂 Enjoy the weekend ahead!